The New York Times said Wednesday it had teamed up with the online service Spotify in bid to lure subscribers with a "news and music experience." The companies announced that new digital subscribers to the New York Times who commit to a one-year term would get free access to Spotify Premium with its 30 million songs and two billion playlists. The offer, which proves access to the daily's digital content for $5 a week, is for US residents who are not current subscribers of the Times or Spotify. "At the Times we are not only dedicated to helping our readers understand the rapidly changing world around them, but also to helping them live better lives," said Meredith Kopit Levien, executive vice president and chief revenue officer of the newspaper. "News and music have gone hand-in-hand since the early days of radio, and because personalization and curation are central to what both the Times and Spotify do so well, we created an experience for Times readers that gives them access to all the news and all the music that they want in one premier subscription." Normally the digital "all-access" subscription to the Times is $6.25 per week, and ad-free Spotify Premium is $9.99 per month. 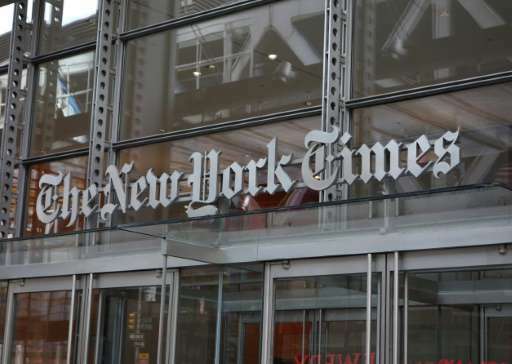 The Times, which has been struggling financially as it transitions to a more digital focus, announced recently it had more than three million subscribers, including two million with digital-only subscriptions. Sweden-based Spotify has some 43 million subscribers, according to the research firm MIDiA, which is well ahead of Apple Music's 20.9 million.